... all his stories are decorated with flamboyant draperies, intended by him to strengthen the plausibility of this statements. In talking, he has the appearance of candor, becomes pathetic at times when pathos will serve him best, uttering his words with a quaver in his voice, often accompanied by a moistened eye, then turning quickly with a determined and forceful method of speech, as if indignation or resolution had sprung out of tender memories that has touched his heart. This is a police detective's description of H. H. Holmes, the masterful liar and serial murderer of Erik Larson's book — one of the devils in his white city. The description comes late in the book, by which time it comes off as a wonderfully perverse joke shared between Larson and you, the reader who has by now come to think of Larson in exactly these terms. Larson is a very slippery and hypnotic liar. Like the guards who mourn when Holmes is executed for his murders, you wish Larson could go on lying to you much longer than he does. Larson's misdeeds are not serious, and I probably care about them only because of my own struggle to learn the lost details behind The Moonshiner's Dance. Often, I would sell my soul to the Devil to discover the level of detail Larson seems to have for events that took place 35 years before the subject of my own research. Minneapolis was small, somnolent, and full of Swedish and Norwegian farmers as charming as cornstalks. Holmes was handsome, warm, and obviously wealthy, and he lived in Chicago, the most feared and magnetic of cities. Even during their first meeting he touched her; his eyes deposited a bright blue hope. When he left the store that first day, as motes of dust filled the space he left behind, her own life seemed drab beyond endurance. A clock ticked. Something had to change. A wonderful passage, but ... but DID a clock tick? IS that what the dust did? Did ANY of this really happen? No footnote is provided. It is clear, though, that Larson has studied late 19th-century Chicago much more closely than Minneapolis, which was not "full" of farmers of any description. It was a pretty rough place, and about as densely populated with prostitutes, drunks, businessmen and laborers of all ethnicities as Chicago was. Ask anyone from Lake Wobegon — they'll tell you about Minneapolis. Holmes was unmoved; Minnie and Anna were horrified but also strangely thrilled by the efficiency of the carnage. Minnie and Anna rapidly grew tired. They exited, with relief, onto the terrace over the North Canal and walked into the Court of Honor. Here once again Anna found herself nearly overwhelmed. It was noon by now, the sun directly overhead. The footnotes acknowledge that the description, while long and detailed and vivid, is entirely bogus, except that it traces the SORT of tour that Chicago residents often gave to visiting relatives. I love this book, and find the paperback edition's blurbage to be mostly well earned. It is indeed a gripping page-turner, thanks to Larson's use of every tool in the novelist's bag. I have enough interest in urban geography to have taken a half-dozen graduate-level courses in the subject while I was in academia (which Larson seems to detest). 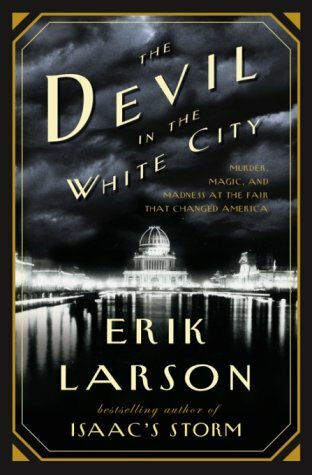 Reading The Devil in the White City, I often wished I'd had it in grad school to get a much better feel for this Columbian Exposition that everyone thought was so important. Likewise, I grew up in the Chicago area and often visited the Museum of Science and Industry without ever grasping that it was the last remaining structure of a history-making fair [see Comments]. I wish The Devil in the White City had been published in 1976 and placed in my hands then. As a developing writer of history, there's a great deal to learn from Larson's work that I haven't often found in the, let us say, "less imaginative" histories I ordinarily read. Now and then, I wanted to slap myself on the forehead and say "Of course!" For example, I know very well what the weather was like on the night of Christmas 1924, when the Victoria Cafe opened in St. Paul, but Erik Larson reminded me that — and how — that weather matters. The Devil in the White City, like any other measuring device, is useful precisely because it goes too far. You can use it to get a fix on how far you'd like to go in contriving history only because Larson's dial leaves a few more tick marks to the right of your own level. To me, much of the drama in this very engrossing book is in watching as both Holmes and Larson get away with murder, and in following the details of exactly how they succeed so well. One night in Tucson in April 1988, on a whim, I turned on a TV. I hadn't owned one for the previous four years, and wouldn't for another six, so anything I saw that night would have made a strong, if dream-like, impression. By chance, what happened to be on PBS was the Houston Grand Opera's production of John Adams' minimalist opera, Nixon in China. I remember having no idea what to make of it. I was 23 and had recently seen Koyannisquatsi, with its score by Philip Glass — my first exposure to minimalism. My deepest immersion in opera to that point had been an afternoon at a University of Arizona production of Mozart's Cosi fan tutte. I no longer have any recollection from that night of Nixon in China's music — maybe I couldn't make enough sense of it at the time to register an imprint. What I do remember was a colossal Air Force One taxiing onto the stage. Now THAT made an impression ... which I guess is what Air Force One is for, no matter where it turns up. Mostly, I recall feeling ill-at-ease with the idea of a grand opera about Nixon's trip to China. Was the composer a Republican? Was this propaganda? Wasn't high art a liberal thing? And wasn't opera supposed to be about the olden times, not something that happened in 1972? I would have had no qualms about PBS airing Wagner's Parsifal — but Nixon in China? 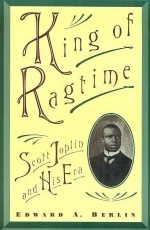 Today, I'm reading Edward Berlin's great King of Ragtime, a biography of composer Scott Joplin. It's not an ordinary bio. 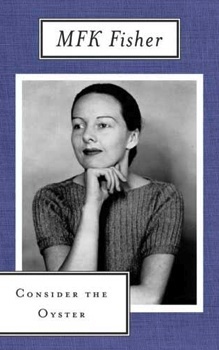 Before this book, much of what was known about Joplin was legend and assumption. Berlin conducted and collected the most minutely meticulous research available and his book catalogs the many questions raised by the new information. When Berlin takes a position, it is the most cautious, cool-headed judgment possible. I find the approach intensely gripping and beautiful ... maybe it's me. Newspapers in the South condemned the invitation as an unwarranted attempt to place the black man on the same social plane as the white man; Roosevelt's act put him in a category with Ulysses S. Grant, and he would never be forgiven. The Sedalia Sentinel printed a poem on page one entitled "[N-word]s in the White House," which concludes with a black man marrying the President's daughter. Scott Joplin seems to have had kinder feelings toward the event. That a black educator would participate in that symbolic ritual of advancement, The White House dinner, seems to have meant a lot to the composer, who was then working to elevate ragtime — widely disparaged at the time as degenerate black noise — to a high art form. In 1902, he named his latest two-step, "The Strenuous Life," after a phrase in one of Roosevelt's speeches. He staged the ragtime opera A Guest of Honor in 1903 — barely two years after the events it depicted. So this was an opera about events as contemporary as Katrina's landfall is today, in a form about as new as gypsy punk. In comparison, Nixon in China was conservative, portraying events of 15 years before in a 20-year-old music genre. Working out these comparisons in more depth might bare a little fruit. While A Guest of Honor was probably meant to elevate a "low" form, some might say Nixon in China went the other direction, increasing the public's (including my own) awareness of minimalism, a high art "descending" into popularity. And so on ... when Booker T. Washington visited Teddy Roosevelt, who was Nixon and who was China? But, for anyone seeking to compare the two operas, the biggest obstacle would be our collective amnesia — the same universal, maddening, heart-sickening forgetfulness I've encountered since beginning my own original research into music history. Joplin brought A Guest of Honor to less than a dozen stages across the Midwest in September 1903, but — according to the best speculation Berlin can support — the production was robbed of its receipts in Springfield, Illinois. Unable even to pay the bill for the touring company's stay at a Springfield boarding house, Joplin was forced to leave behind a trunk as collateral. It contained some of his personal effects, including unpublished manuscripts that may have included the score of A Guest of Honor. Those items were never recovered. Although a copyright for A Guest of Honor was applied for, the copyright office never received the customary copies of the score for its files. In a book full of careful modifiers and provisional judgments, one sentence stands out for its disheartening brevity: "A Guest of Honor is lost." Of course, various productions of Nixon in China are available from Amazon and iTunes in a variety of formats. Its memory is safe, despite having been composed in what I think of as our forgetful era. John Adams himself seems on track to be long remembered as one of the 20th Century's major composers. Though we're more likely to learn about him on Antiques Roadshow or History Detectives than on Great Performances, the researcher who stumbles across an overlooked copy of A Guest of Honor would be remembered at least as long as Adams. Like Berlin's King of Ragtime itself, the thought puts me in the mood to work. I got to meet a philosphy of science hero of mine, Joseph Rouse, and talk with him at length. At the end of the conversation, I asked him to sign my copy of one of his books. For a moment, he looked very puzzled — apparently, philosophers of science do not regularly have fans who ask to have their books signed. Once he got the idea, though, he seemed to relish the opportunity. A minor point in that book keeps coming back to me. Imagine, if you will, that you and a friend are walking along and happen upon two people who are having an argument. One is insisting, "Snow is white." The other insists, "Snow is NOT white." I don't know why — maybe they're artists, or meteorologists, or, maybe ... zoologists? Anyway, you and your friend are philospophers of science. You eavesdrop for a while and then get into your own argument. You insist, "The statement 'snow is white' is true." Your friend insists, "The statement 'snow is white' is false." Now ... the question is, what are you two philosophers contributing to this debate that the two orginal debaters could not contribute on their own? Unless you're very much more careful, the answer is: Diddly Squat. The problem has to do with what philosophers can do for (or do about) science without either becoming scientists on the one hand or, on the other, being totally irrelevent. If you want to debate whether quarks "really exist," or whether scientist's conclusions really follow from the evidence they've gathered, you are likely to repeat the same arguments scientists themselves debate very regularly and with a much better command of the complications involved than philosophers usually enjoy. Thinking about this deeply left me finally agreeing that science — if well done — is something I ultimately trust to answer its own questions. It also left me feeling that I should leave the question of the value of the philosophy of science to others. I studied a lot of philosophy of science in grad school, and I'm very glad I did — it deepened the way I understand a lot of things that are very important to me personally. Still, looking back, most of the big questions I thought I was grappling with then no longer seem important to me, and ring a bit hollow. But two details do seem to keep coming back to me ... and if they keep following me around, they must matter somehow. We spent a lot of time talking about how much the stuff scientists talk about are "social constructs" — stories scientists tell each other as a group of folk that make up a culture — and how much they're something else having more to do with the universe they study. Always, during these discussions, some guy or other would get rather aggressive and try to prove that "things exist" by banging his fists on desks, kicking chairs, thumping his chest like an ape, etc. Eventually, it became clear to me that whether or not desks are, in fact, hard is rarely a question that real scientists debate for very long. More typically, they debate things like, say, how to reconcile two experiments that give different answers for the precise magnitude of dark energy, or whether a certain experiment in a particle accelator really did create a certain particle for a miniscule moment, thereby implying some new form of energy field, and so on. There's no need for philosophers of science to go around slapping themselves. The real questions are much more subtle. You can draw whatever Moral of the Story you please. I suppose one lesson is that the most vivid, dramatic, immediately impressive arguments are very often not correct. Thanks go to "The Bottom Line: The Rhetoric of Reality Demonstrations" by Ashmore, Edwards and Potter, in Configurations: A Journal of Literature, Science, and Technology. Night used to be dark — really dark. When the sun went down, you pretty much couldn't see your own hand in front of your face, unless there was a moon in the sky, a display of aurora, or lightning. Or you could get light from some kind of open flame. To accept this as fact is easy enough, but to imagine it as a reality is hard for people living in the 21st century. Consider the problem of trying to imagine living by candlelight. Candles used to be made of tallow (essentially animal fat) and bee's wax. Both cast a dim, yellow, flickering light. Sometimes a tallow candle would spatter hot fat on someone nearby. The first major challenge to deep darkness at night was from gaslight in major cities, made possible by late-19th century coal and oil refining. To respond to the challenge presented by the great steadiness and brightness of gaslight, the candle industry developed the paraffin candle, which produced much brighter, whiter, and steadier light than wax or tallow candles ever did. But paraffin is a byproduct of the same refining technology that produces gaslight. So the candle itself has been modernized to respond to the challenges of technology. If you want to imagine life before Night was banished, it won't work to simply light some candles and turn off all your lights (don't forget the VCR display and the clock radio and the light from your neighbor's porchlight leaking into your windows!). The candles you're likely to be usings are already modern lighting techology. Today, I bought a copy of Nicolaus Copernicus' book, On the Revolutions of the Heavenly Spheres, in an edition edited by Stephen Hawking. The original 1543 book helped inspire people to give up the idea that the Earth was the center of the Universe, and that the Earth circles the Sun, not visa versa. As I understand it, the change was such a shock and so deeply altered the way people saw the hierarchy of things, in both the heavens and on Earth, that for centuries, whenever people talked about similar upheavals, they would call them another Revolutions, meaning Copernicus' book. After a while, the association of the term with the book got forgotten — hence the word "revolution". Trouble is, in the original title, De revolutionibus orbium colestium, the word means "spinning around and around in circles," as in, "the going around of the celestial orbs." So the root word of "revolution" is not "revolt," it's "revolve" — to wind up exactly where you started and have to do it all over again. And all too often, that's how revolutions have gone, at least outside of science. You wind up with the same cast of characters, at best, and you have to stage another revolution, over and over and over. I swear, the fact that this is Tax Day is PURE COINCIDENCE!